U.S. Patio Systems and Home Remodeling offers an exceptional selection of high-quality replacement bathtubs to residents of St. Paul, Minnesota. Our suppliers, Bathwraps and The Onyx Collection, are well-known throughout the industry for manufacturing replacement tubs of outstanding quality. 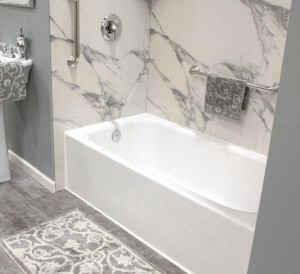 Bathwraps, for example, manufactures replacement bathtubs that are made of 100 percent nonporous acrylic, a material that has earned widespread acceptance throughout the bathroom remodeling industry for the advantages it offers over conventional tub materials, like fiberglass. Easy to clean – Because acrylic is nonporous by nature, it doesn’t easily fall prey to the accumulation of grime and is remarkably easy to clean. Just be sure to avoid harsh or abrasive cleaners as acrylic is prone to scratching. Mold and mildew resistant – Again, because it’s nonporous, acrylic isn’t a hospitable breeding ground for mold and mildew. Long lasting – The useful life of an acrylic tub is 30 years or more. It will retain its high-gloss finish for decades and not crack, chip, rust, or deteriorate. Acrylic is an exceptionally durable material that stands up great to daily wear and tear. For more information about the acrylic bathtubs that are available from U.S. Patio Systems and Home Remodeling, please contact us today. We proudly offer professional bathtub replacement services throughout the St. Paul, MN, area. U.S. Patio Systems and Home Remodeling is a leisure space specialization company.